Within the UN's striking architectural complex, diplomats from around the world make decisions that impact world peace, economics and health. This is the largest (1,800 seats), most famous and most visually striking room. Representatives from nearly 200 member nations meet here to debate and vote. Heads of state give major speeches here. This is the official meeting place of the five permanent members (China, France, Russia Federation, United Kingdom, and the United States) and the ten elected members. It is politically powerful. 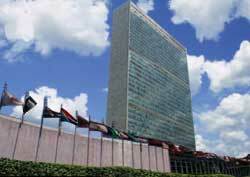 The United Nations is an international territory, not a part of New York or America. However, most travel guides (including mine) include it in their New York or US guides because from a traveler's perspective, it belongs there. Being under the UN's independent status, some staffers are not subject to certain New York and American laws.